I think this is a really cool thread. Y'all are doin' some interesting work, and it is really neat to be able to see what other people are doing. The "just out of my control" part of this is what drives me, in some ways. I can get really close to controlling it the way I would like to, but never quite within my grasp, either. But that is what makes the quest worthwhile, is it not ? He does polish other blades, though, mostly it is just a matter of getting into the que. That can be difficult. 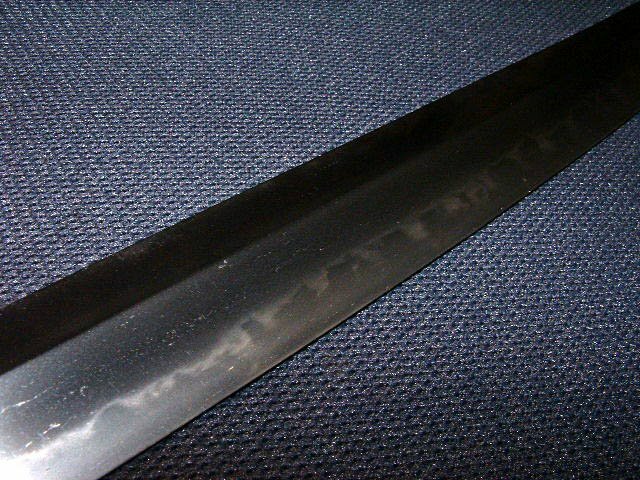 Interests:Electronics technician by trade, I make knives and swords, train and teach Japanese swordsmanship. I'm a dog lover and enjoy flight simulators as well. One of mine. 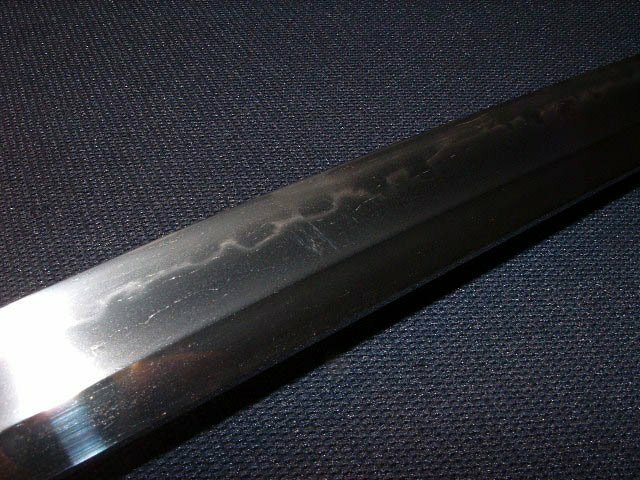 A beat up FatBoy tanto blade out of 5160 that has been bent over and staightened, hit with files and pounded into enough nasty stuff to break the tip off. Notice how I put my junk in between pictures of stuff done by the really talented makers. 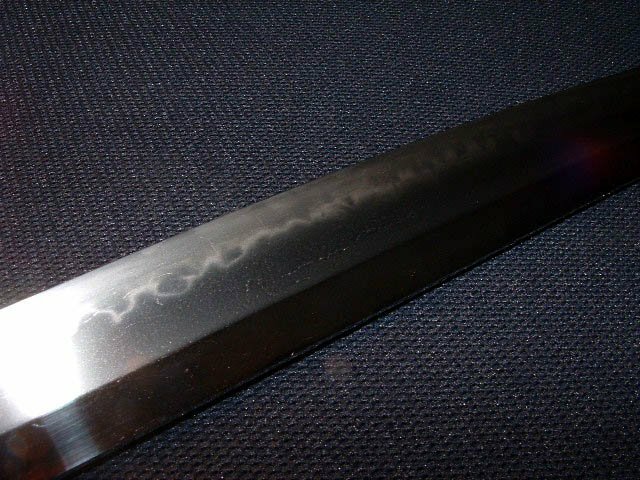 Actually I have some stuff that is starting to look decent hamon-wise lately but I haven't been able to stop and shoot pictures.....some of the hamon on the 5160 tactical test pieces have been pretty nice if I *do* say so myself. Now I just gotta stop testing and finish a couple this fall. Here are two I Just finished up, one is for the SITH. As I stated in previous post, I am absolutely amazed at what I see and it gives me some thing to strive for and as much as we try to deny what we really know to be true, is that we want to create the perfect hammon that will amaze everyone and that most would have a hard time beating. Well I am here to say that every one I have looked at, no matter how simple or complex it is they are all perfect. 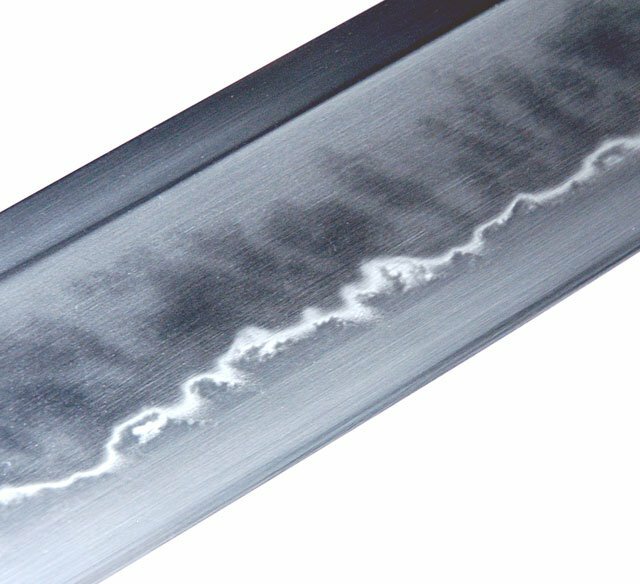 And the mere fact remains that we are affecting a change in the very steel and that it says something about about each and every bladesmith. 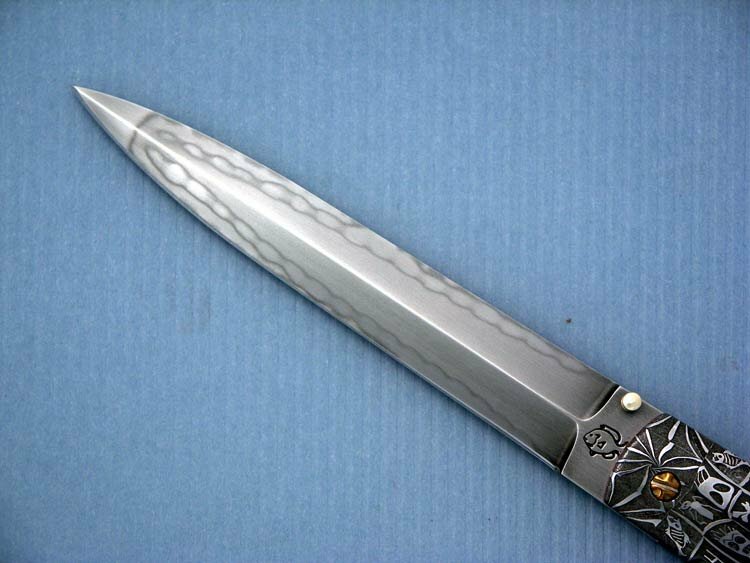 And there is no real words for it only that each bladesmith feels it in his heart when he creates a new blade. WOW I think I hurt my headon that one. Beautiful Work !! Can the artist showcasing their work add pictures of how they are heat treating? Clay, temps, quench? Thank you. Here is a project from two years ago. 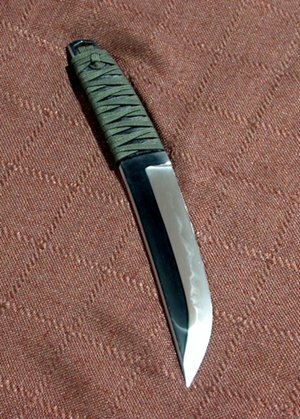 1095 forged Hog hunter. 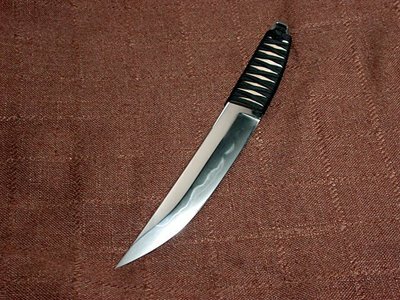 Big blade (11") with a two fisted handle. Thick clay coat, dried in front of my wifes wood fired oven, heat to 1600, water, triple temper at 350. Very clear straight hamon that the client requested. Clay is potter's raku clay. Today I do it very different, but have not photoed enough. WOW again I mean man these hammons look fantastic. 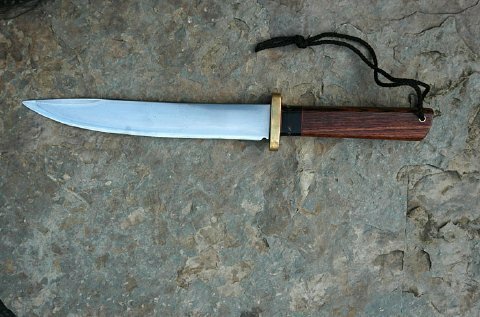 Thanks Howard you input is very welcome in here as I have admired your work for a very long time, even before I got into bladesmithing. 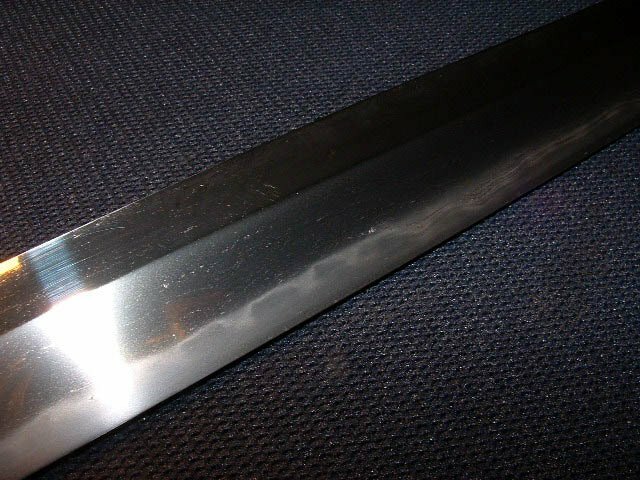 Actually you and (The Late) Mr. Moran and a few others actually influenced me into bladesmithing, I have followed your experiences with certain types of steel and what you could accomplish with it. With bated breath to say the least. So my hat is off to the gents and ladies who contribute to the bladesmithing realm. Come on guys, I know that there are more out there. 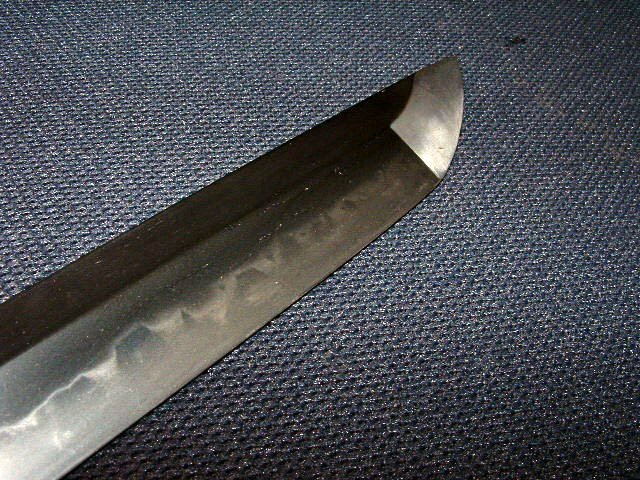 I found this on ebay, a katana with a very nice hammon. I am not sure on the type as I think the guy described this a being sugha which would be wrong to me, as it looks like a dove tail hammon, I saw one some where on this forum before. Any thoughts would be appriciated. Well I have not checked in here, for a few weeks and I am sad to see no one posting any more picts of their hammons. 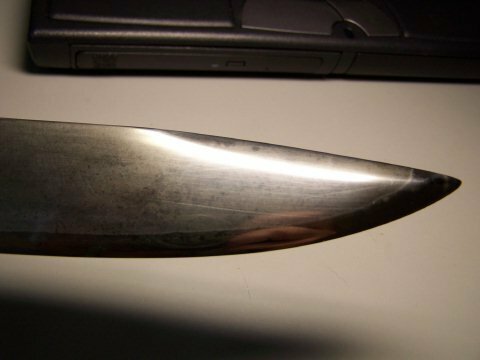 I will be posting some picts shortly on a knife I am polishing. Holly cow those are beautiful blades, what type of steel did you use? Don that is a great hammon, I love the utsuri. I hope everyone that wants to will contribute. Thanks everyone for making me clayhardening - this is SOOOO much fun!!!!! Wow, great work. I LOVE your hamons Mr Fogg, they always look like they are alive, and not in the sense of alive like vibrant and clear(though they are), I mean alive like an animal, or something. Here's my latest. 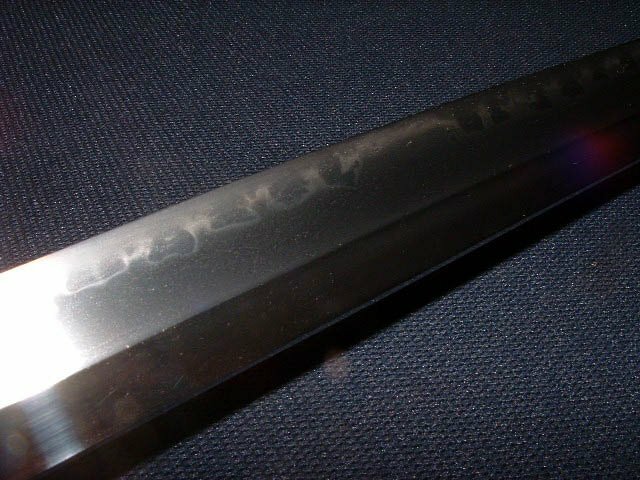 It's W2/1095 folded steel. 1200 layers. There's a strange optical illusion that makes it look like there's a dip in the edge. I'm going to reshoot. But you can see the hamon fine. Walter that is a beautiful hammon. I can barely wait for the video to be done. Interests:Hitting things really quite hard. 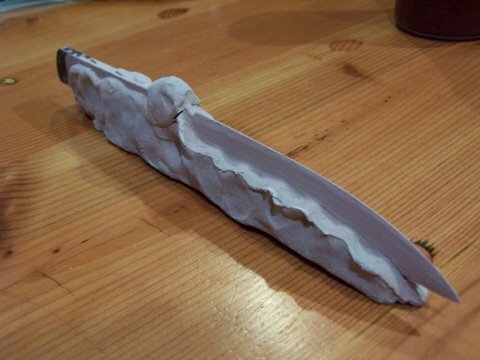 A Blade I made for a collaborative knife over on British Blades. Walter, Great hamon man !!! This ones a bit different and it's a folder. Steel is W1, I need to try W2 in one of these small forlder blades soon. 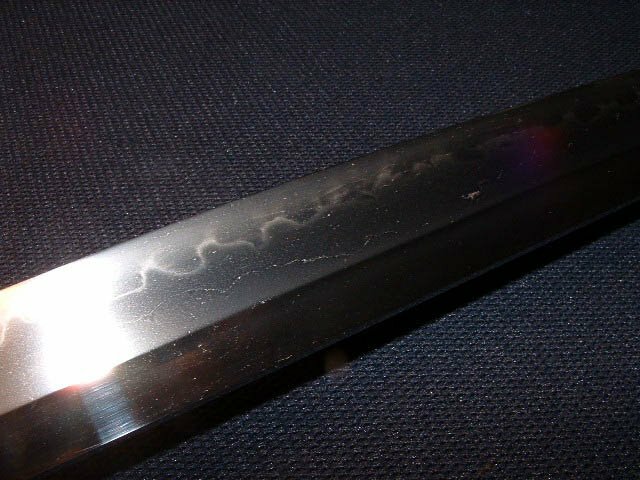 Here is a 7 3/4" tanto about 1" wide which is forged from iron ore I smelted. I began with iron ore from central Wisconsin. The iron at this particular source is bound with granite and the material needed to be roasted, crushed and then smelted to separate out the iron. 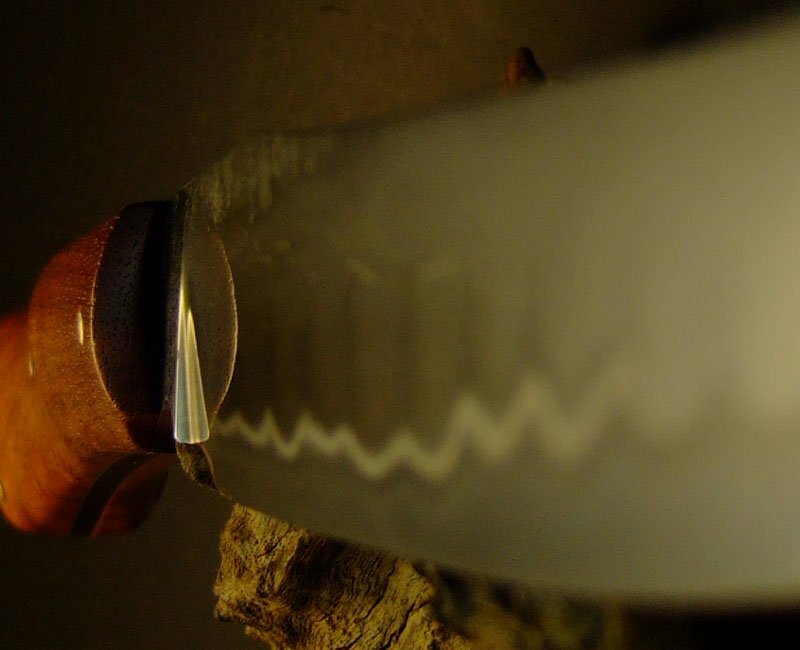 The hada is regular and the hamon has quite a bit of interesting activity. 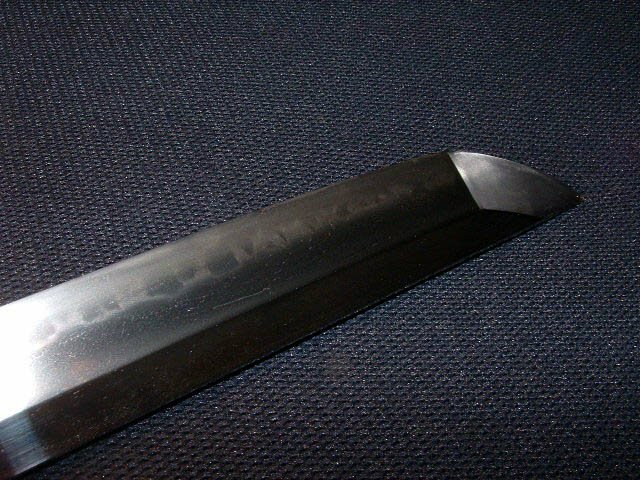 Traditionally on the ayasugi hada blades the hamon would be straight (suguha), but as I am not a member of that family I can take some liberties. 1080 (really 1075 with low manganese from Admiral Steel),austenized in salts, water quenched. 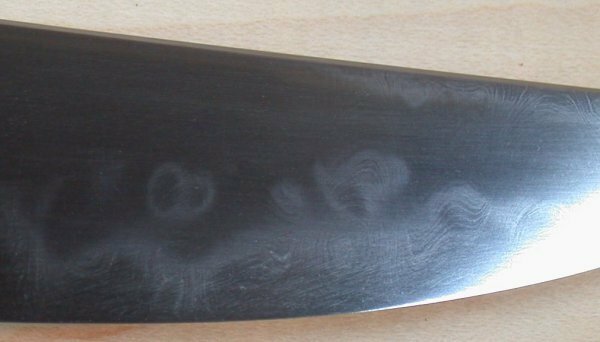 It's the most shallow hardening steel I've ever worked with and too crack-prone for my taste. Joe, nice wak you made there. Here's a shot that I may have shown here a while back but thought it would add to this thread. 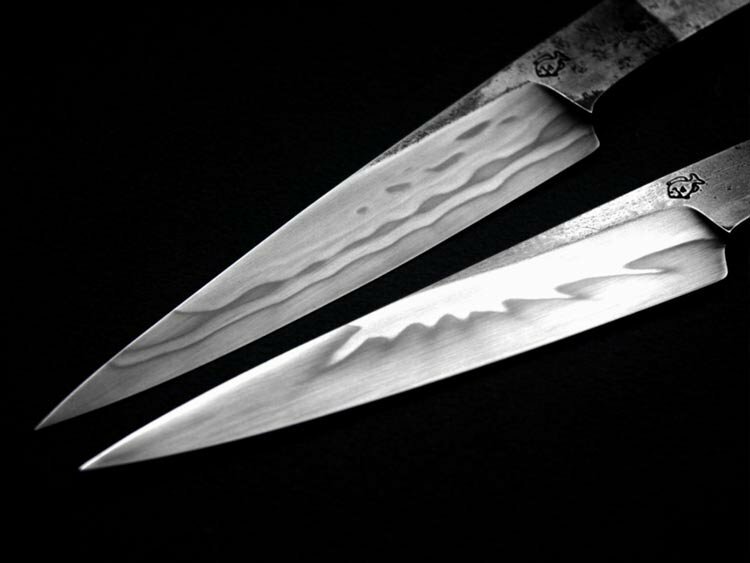 W1 kitchen knife blades. Don I have to say your hammons and Walters really speak to us. No disrespect to anyone else but you have to admint their hammons really speak volumes to us as far as activity and design. I wish Rick Barrett would post in here his hammons are beautiful as well.